Publisher: Sony. Developer: Clap Handz. Genre: Sport; Golf. Other versions: PS3. Whilst Uncharted: Golden Abyss stirred the hype machine and Escape Plan courted the critics, the Vita’s best launch game received barely a hint of fanfare. 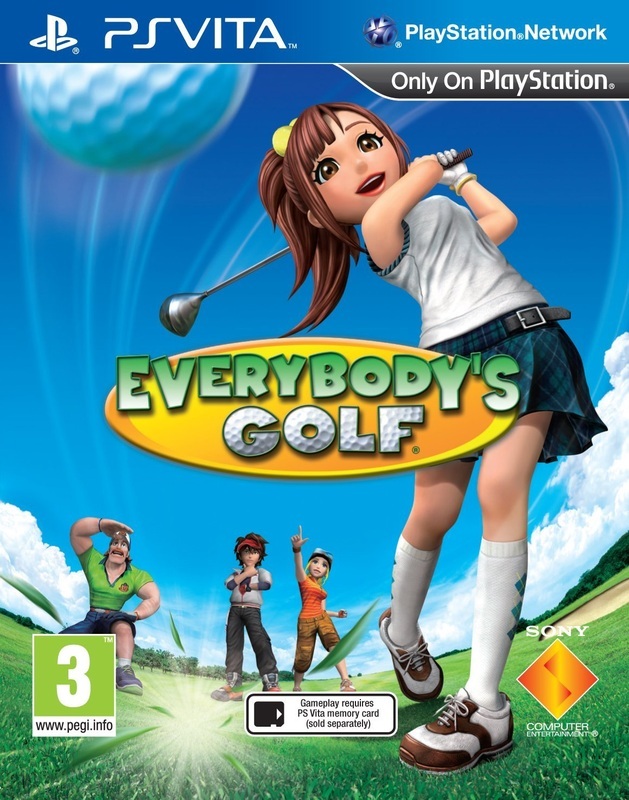 In Japan at least, it didn’t go unnoticed; Everybody’s Golf was the format’s biggest seller out the blocks, and whilst Clap Handz’s diminutive golf title doesn’t deviate too much from the games it follows on from, it looks and plays beautifully, adding just enough in the way of new features to make it a definitive entry for fans of the genre. 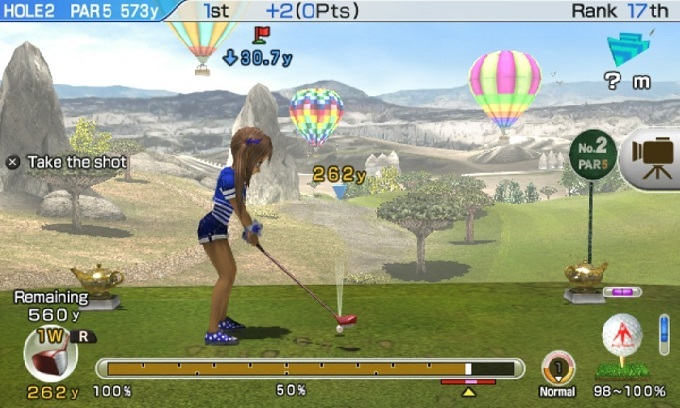 Reviewing new Everybody’s Golf titles can be a taxing job, as each time a new one rolls around, the synopsis remains much the same: it builds a little further on an already-excellent foundation, plays as flawlessly as ever and throws up almost nothing in the way of frailties or discrepancies. That’s perhaps no great surprise, as it sticks very closely to the tried-and-tested gameplay of its PS3 predecessor World Tour, with which it shares plenty in common. Whilst it’s not the dictionary definition of perfect, it is at the same time extremely hard to find fault with, as everything works just-so. Defining it’s qualities in this manner sounds almost blasé however, and doesn’t do justice to how good it is for a handheld launch title. It can legitimately count itself among the finest entries in a lineage that’s replete with great games. Operating the same fiendishly addictive, quick-fire brand of golf that has made the series so moreish and satisfying to play down the years, Clap Handz have found the golden formula that melds streamlined, simplistic gameplay mechanics with challenging courses and considerable depth. 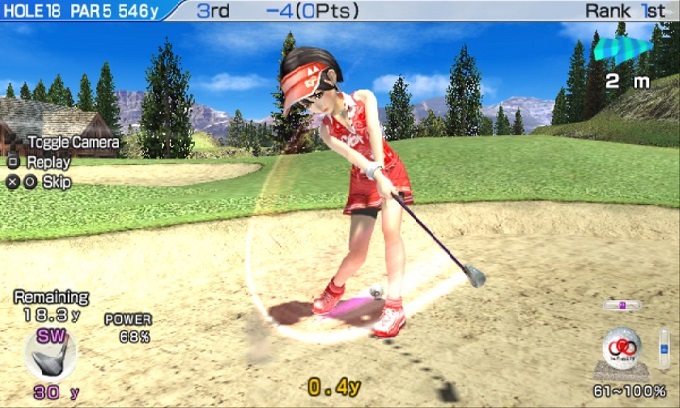 Only one button tap is needed to determine power, and another to strike the ball, but in addition to timing, interpreting the surroundings is integral to a good round; gradient, elevation and wind speed are all factors that can send a potentially good shot into the trees, and the need to strike a balance risk and reward proves near-constant. At its best, it’s completely riveting. Unusually, EG is equally suited to both lengthy sessions and quick blasts. For those looking to settle in for an evening, there’s the prospect of periodic online tournaments and a lengthy, challenging Career tree to keep you engaged. If time’s short however, you can always dip into the turn-based hole-by-hole challenge against a mate, or a nine-hole blitz to challenge for your best scores and unlock new content. 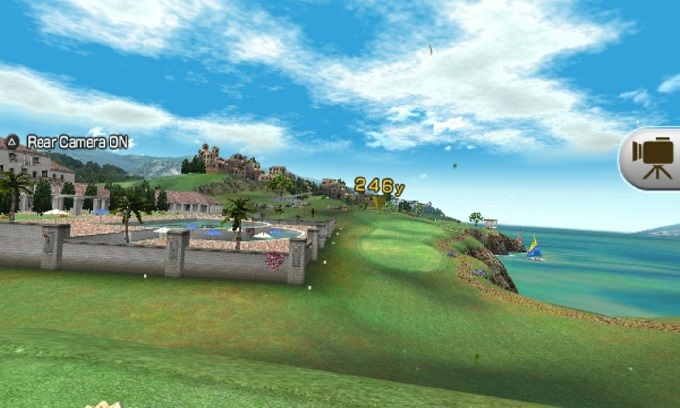 Everybody’s Golf looks absolutely sumptuous. Bright, sun kissed courses lend it an attractive, pleasant vibe with plump, amiable cartoon personalities meaning EG feels a world away from its drab contemporaries. The courses are incredibly easy on the eye, but it’s not just their incredible definition that stands out, but individual holes prove memorable too. The Al-Arabian course offers an unforgettable, picture-postcard tee-off against a sky filled with hot-air balloons, whilst La Provence Resort sees the player having to thread the ball perilously across the water between yacht sails. Every animation, menu screen and replay shows off the sheer quality of the game’s presentation; it’s an absolute treat. Indeed, with a very familiar look and feel, it could be argued that what holds Everybody’s Golf back from an even higher mark is that it perhaps plays things a little too close to its predecessors. This is being hyper-critical however, and it’s easy to overlook the fact that a few small changes can make a big difference. 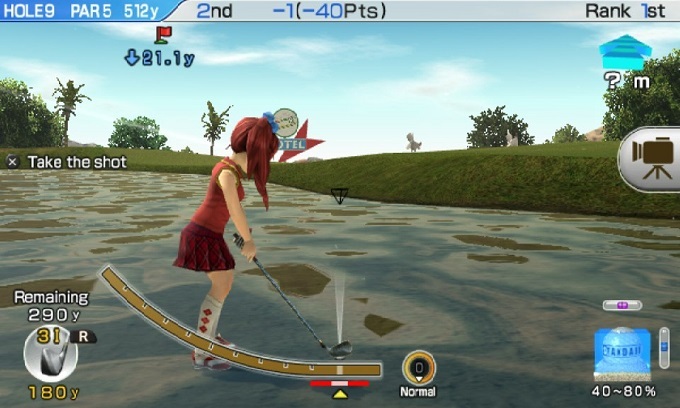 There are now five styles of shot gauge to try (three more than its most recent predecessor), whilst Everybody’s Golf also makes a few relatively unobtrusive forays into utilising the Vita’s tech. The player can rustle trees, trace ripples through streams and adjust their tee position with the touch-screen, whilst more impressively, the first-person view creates a 360 degree window into this inviting world, which tracks as you move the Vita. Of greater significance is the fantastic online suite, which offers all manner of multiplayer options. The Daily International Tournament almost single-handedly ensured Everybody’s Golf remained a fixture in my Vita for weeks on end, as each day you play a round on a specific course with set rules, and then measure how your score stacks up against others – it’s a great way to earn character loyalty points for and currency towards the cavernous selection of extra costumes, gallery pieces and golf kit that are available via the shop. Online competitions build a sense of community, whilst the pull of completing tournaments with additional parameters means the single-player is well catered for too. 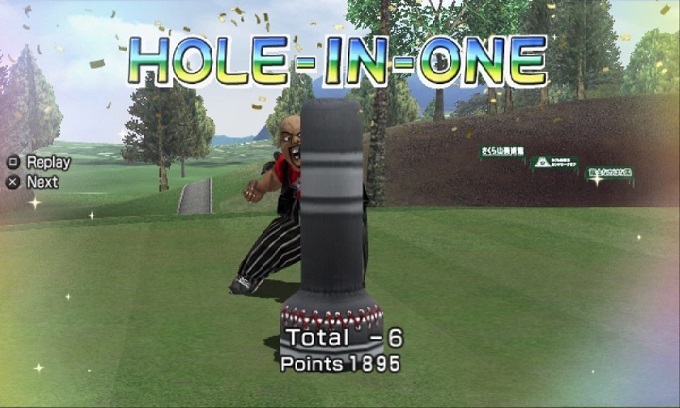 As regular and reassuring as ever, Everybody’s Golf offers up yet another slice of great golfing. You’ll know exactly what you’re buying into if you’re a fan of the series, but it would be a disservice not to mention just how well it all comes together on a handheld, and how a few small touches round the edge turn a decent golf game into a Vita mainstay. It’s a pleasure to play, a game that offers considerable fun and real substance, and just about as good a golf game as you’ll play on any format.